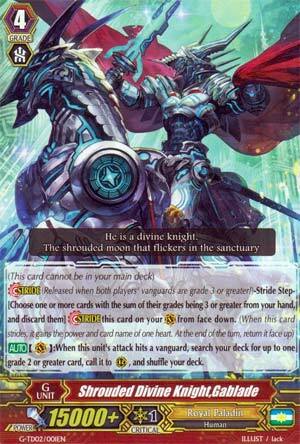 (This card cannot be in your main deck) Stride (Released when both players' vanguards are grade 3 or greater! )-Stride Step-[Choose one or more cards with the sum of their grades being 3 or greater from your hand, and discard them] Stride this card on your (VC) from face down. (When this cards Strides, it gains the power and name from one heart. At the end of the turn, return it face up.) [AUTO](VC):When this unit's attack hits a vanguard, search your deck for up to one grade 2 or greater card, call it to (RC), and shuffle your deck. We have a double whammy to end the week on (because to be honest it would be remiss of me not to mention the final two selling points of the deck at the same time. So we have one of the two for today, Galblade, Royal Paladin's Stride option until March. His on-hit skill, unlike Mystery Flare, is much more readily available. It costs no Counterblast, and so when it does hit, you get a free Grade 2 from the deck to the field, no strings attached. This is better. It provides incentive to not let it hit in the middle of the game, and it searches important units from the deck (cards like Gildas and Proud Roar Lion in Seekers for example) when it does. As far as first Strides go, he's a good opener. Get 4 for your Royals. And here we have the illegitimate love child of Sacred Wingal and Light Saver Dragon. According to the Lore, Gablade existed many centuries ago and was the Hero who kept the Dragon Empire from taking over the United Sanctuary after the Grand United Sanctuary broke up. Due to Altmile's ability to Stride, he was pulled to the Present day to fight along side the rest of the Royal Paladins. Quick question, if that's the case, then just how old are Alfred, Blaster Blade and Dragonic Overlord? Anyway, when Gablade hits a Vanguard, you can superior call one Grade 2 or higher unit from your deck to the field. Hey, it's a nice bit of on-hit pressure to force your opponent to guard and a free search? Hooray! Hey, Thing Saver, this is how you do Royal Paladins! Oh, I see... Well, if you use this to fetch Monday's card, then you have some serious advantage going on. Find out what I mean next week, folks. But for now, I have to say, this is going to be a staple for Royals for quite awhile.